Need a go to dessert for any occasion? 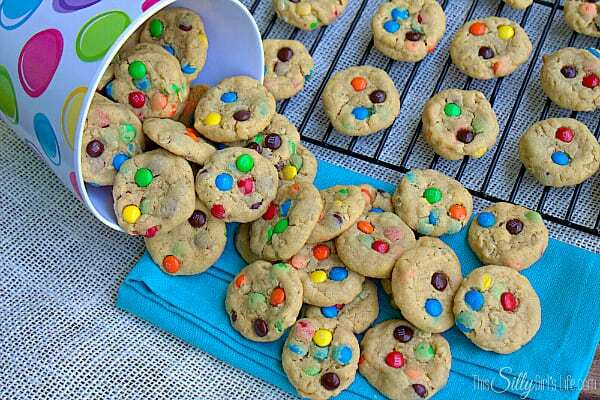 Check out The Best M&M Monster Recipes! With delicious flavors and so much variety, monster recipes are proven to have kids and adults alike coming back for more! Who doesn’t love Monster Desserts? Ever since being a little kid I have loved the flavors of Monster treats! Then again, what little kid doesn’t want M&M’s no matter what recipe they are in? The chocolate candies and sweet flavors always made treats like these some of our absolute favorites! We have selected our favorite and most delicious Monster Desserts to share with you, and we know you are going to love them! There are so many different types of monster desserts to make. You can choose whatever you may be in the mood for. Are you craving cheesecake? Maybe you just want some classic monster cookies, or do you need an appetizer to wow party guests? We have you covered! With so many delicious options, you can find something that everyone will go crazy for! We know for a fact that any of these desserts will have people asking for your recipe and wanting to know where they can get more! So, which one are you going to try first? 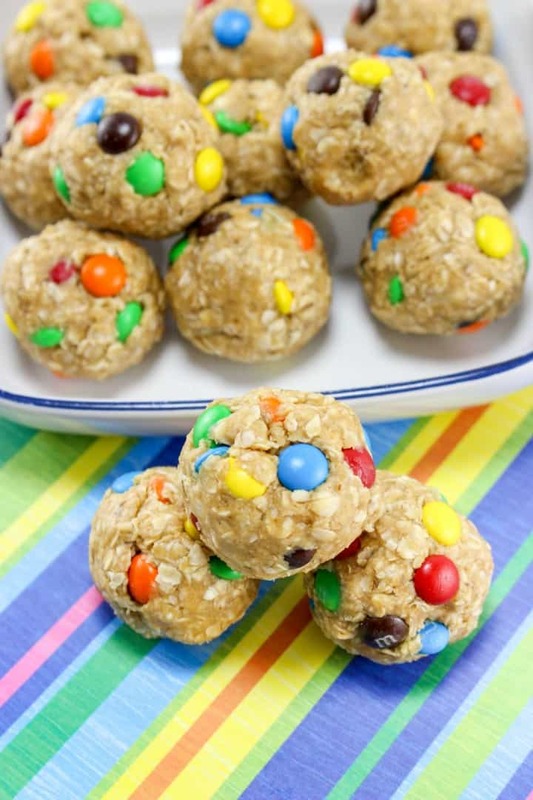 From The Suburban Soapbox:: Click HERE for the RECIPE Healthy, egg-free and packed with protein, these No Bake Monster Cookie Dough Bites are a sweet treat the whole family will enjoy. A great snack for the lunchbox or a post workout pick me up, they are ready in about 5 minutes flat! From Sweet Recipeas:: Click HERE for the RECIPE These are so amazing. Can you imagine the look on your your kids’ faces when they see how good these look? 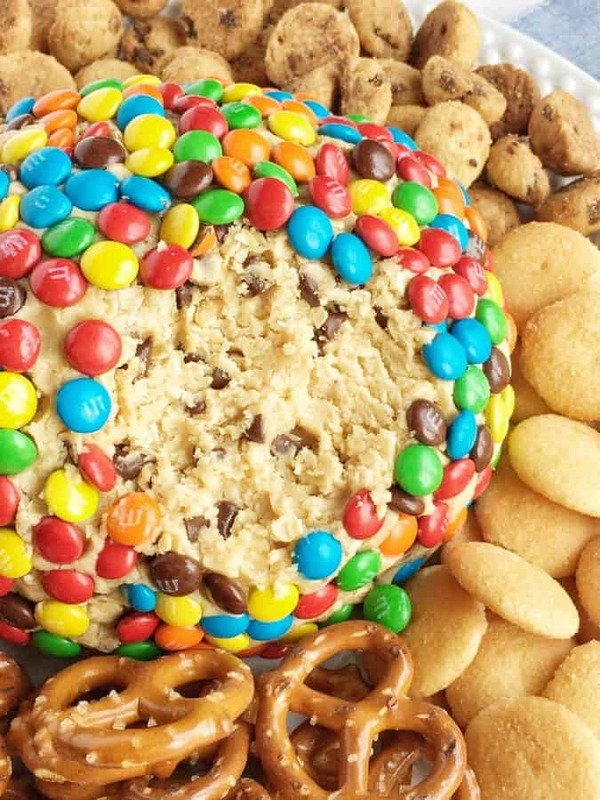 From Together as a Family:: Click HERE for the RECIPE Monster cookie dough cheeseball dip has no eggs and no flour! 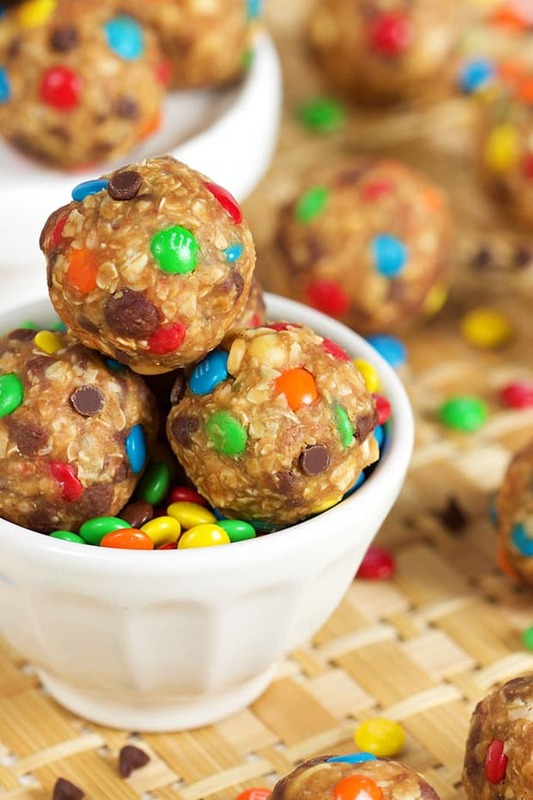 Everything you love about monster cookies; oats, peanut butter, chocolate chips, and m&m’s but in a fun and tasty cheeseball. Serve with pretzels, graham crackers, and cookies. From Tastes of LIzzy T:: Click HERE for the RECIPE Your favorite cookie meets creamy cheesecake! 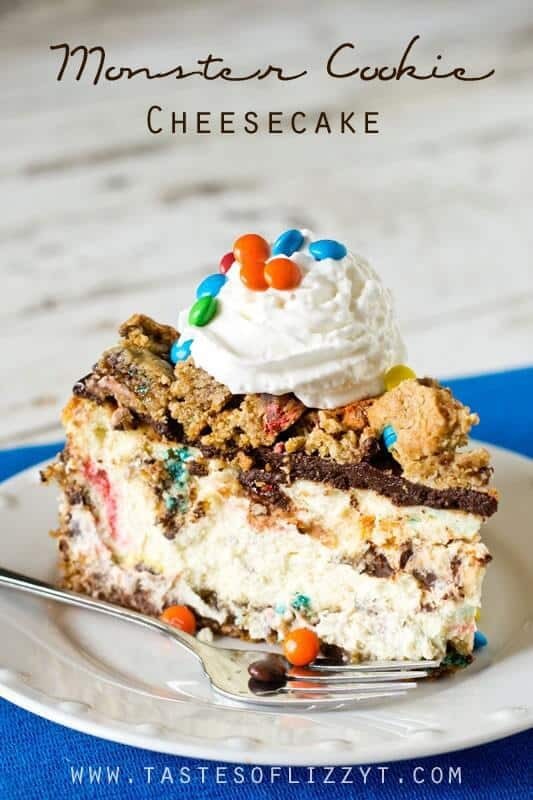 This Monster Cookie Cheesecake will be a hit with cookie and cheesecake lovers alike. 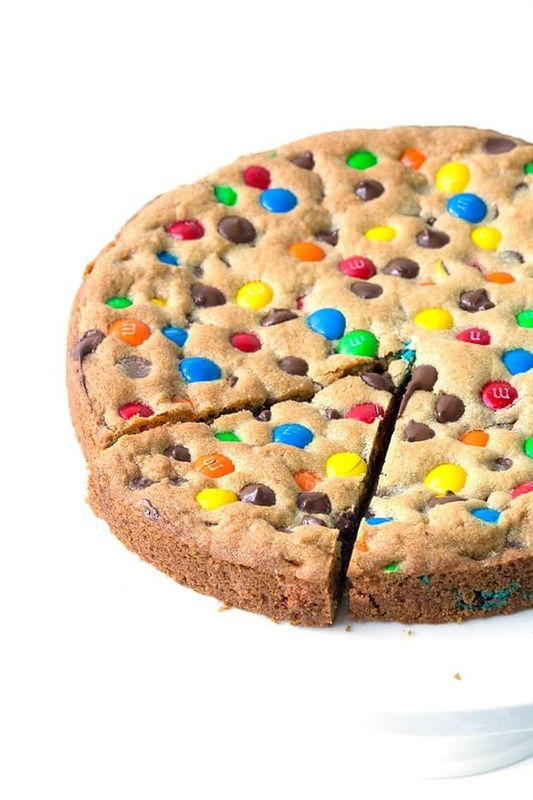 Cookie crust with M&M’s swirled throughout and a chocolate ganache topping. From Together as a Family:: Click HERE for the RECIPE Classic monster cookies loaded with peanut butter, oats, chocolate chips, m&m’s. 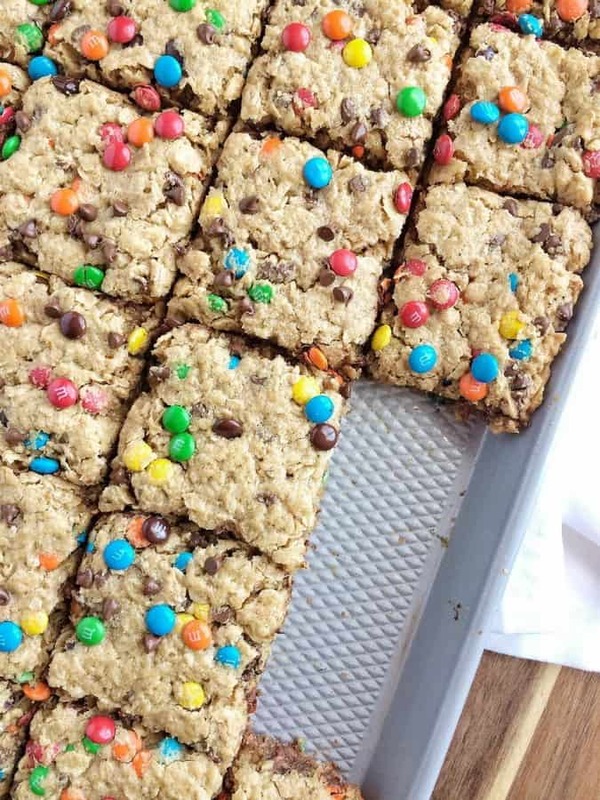 These no flour monster cookie bars bake in a cookie sheet and are the most delicious cookie bars you’ll ever have. Plus, there is NO FLOUR in these! 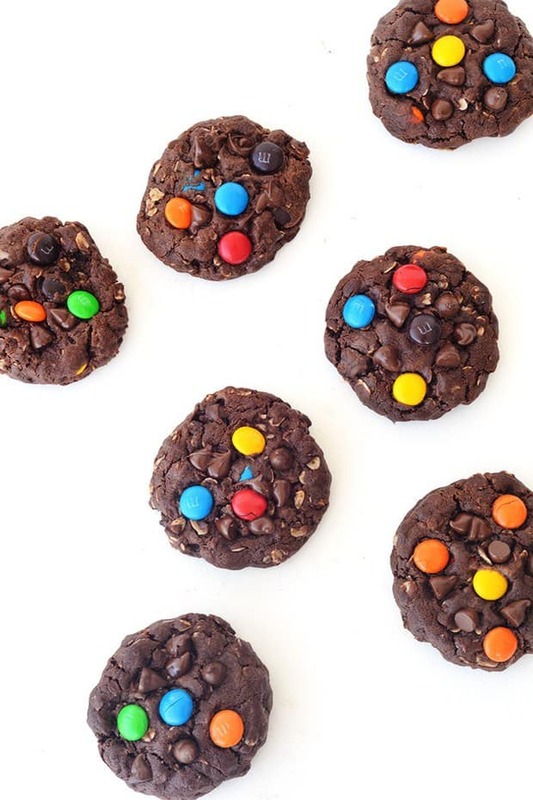 From The Sweetest Menu:: Click HERE for the RECIPE These Chunky Chocolate M&M Monster Cookies are totally loaded. We’re talking peanut butter, chocolate chips, rolled oats and M&M’s to name but a few. 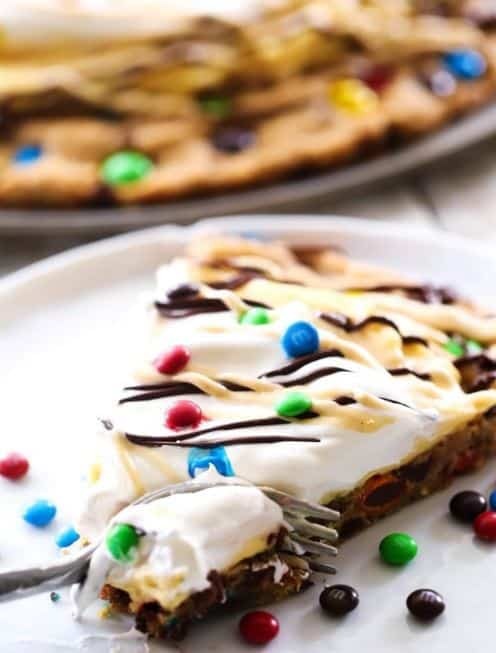 From Chef in Training:: Click HERE for the RECIPE This M&M’S Monster Cookie Pizza is the ultimate dessert! It is layer upon layer of heaven! Everyone will be raving about this recipe! 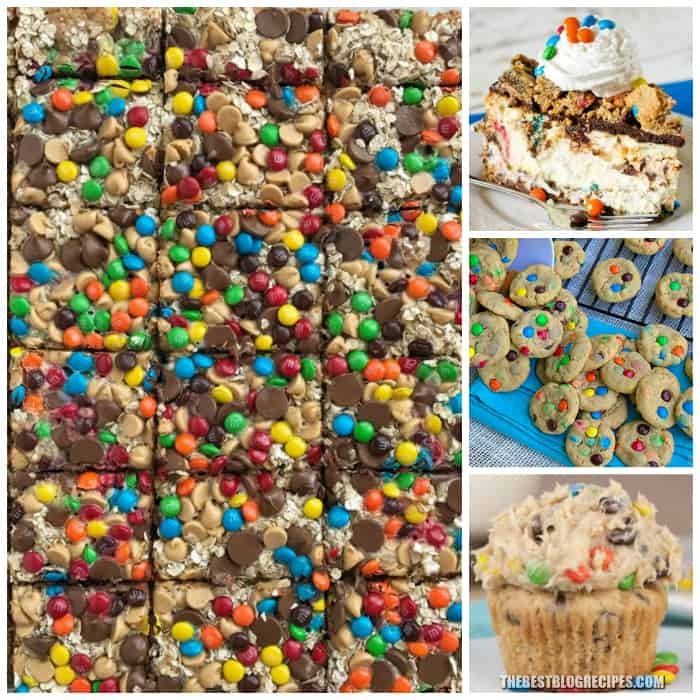 From Together as Family:: Click HERE for the RECIPE All your favorites about monster cookies but in no-bake, egg free monster cookie dough bars! Peanut butter, oats, chocolate, and m&m’s. These can be made in just minutes and are a fun treat or dessert for the kids to make. Everyone will love these easy and simple cookie dough bars. From: Princess Pinky Girl :: Click HERE for the RECIPE These No Bake Monster Cookie Oatmeal Energy Balls will feel like a special treat, but are actually a healthy after school snack! 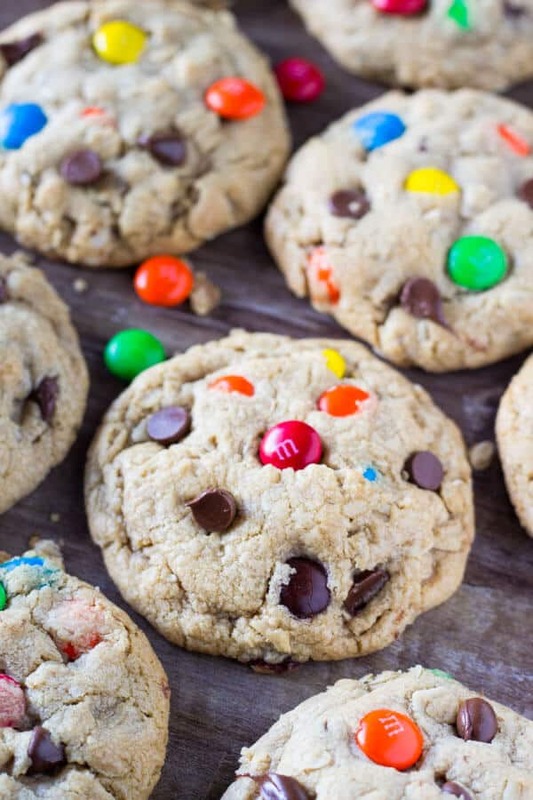 From 5 Boys Baker:: Click HERE for the RECIPE These M&M Chocolate Chip Monster cookies are truly “monster” when it comes to their size. That’s the dangerous part about these cookies. From Together as Family :: Click HERE for the RECIPE All the classic flavors you love in a monster cookie but in a magic cookie bar! 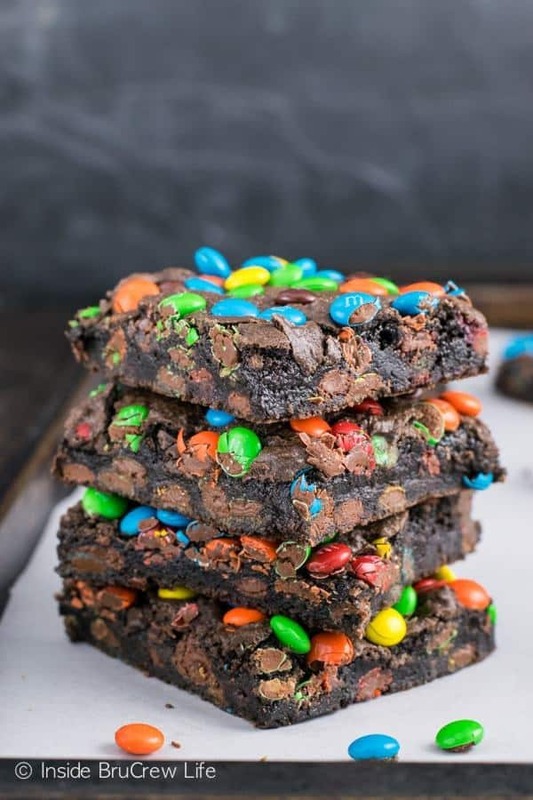 These monster cookie magic bars have a salty sweet graham cracker crust and then loaded with oats, peanut butter chips, chocolate chips, m&m’s and drizzled in sweetened condensed milk. 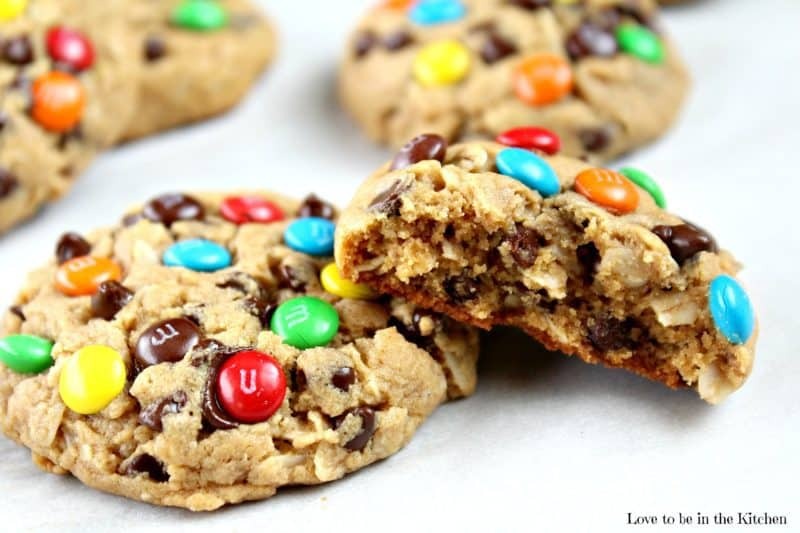 From Love to Be in the Kitchen:: Click HERE for the RECIPE A soft and delicious healthier Monster Cookie made with peanut butter, oats, mini chocolate chips and topped with colorful mini M&M’s. There’s no butter, oil or flour in these cookies! 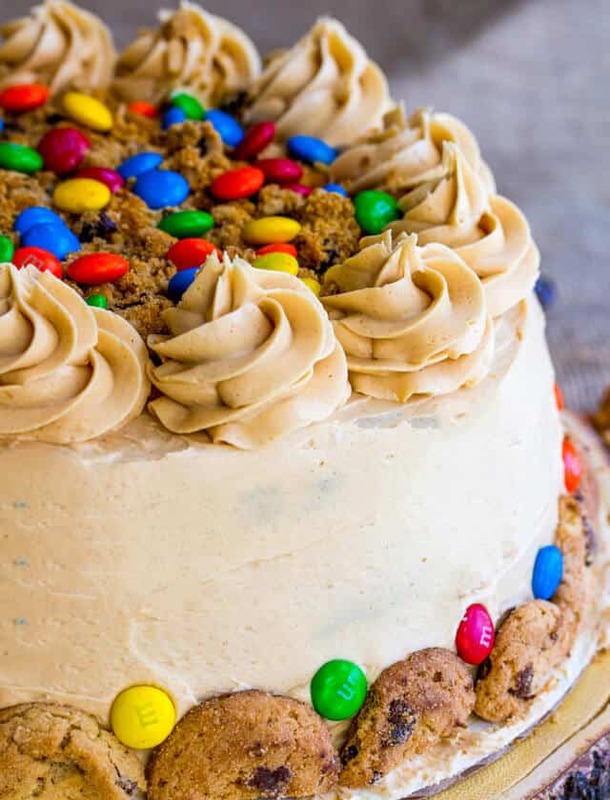 From: Tornadough:: Click HERE for the RECIPE One of the most loved cookies gets a face lift with this moist and delicious Monster Cookie Cake. A fun delicious spin on a classic treat! 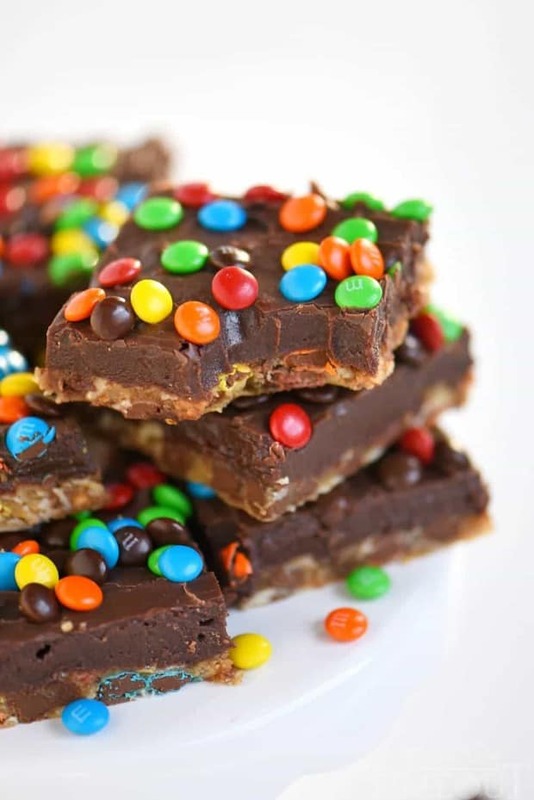 From: Mom on Timeout:: Click HERE for the RECIPE No one can resist these EASY Monster Fudge Bars! 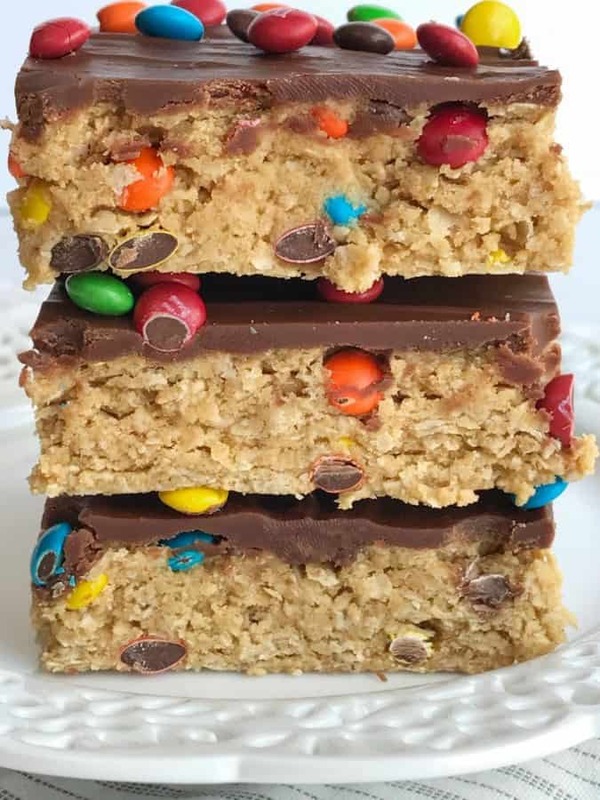 Oatmeal chocolate chip cookie bars topped with easy fudge and mini M&M’s! This is one decadent treat! 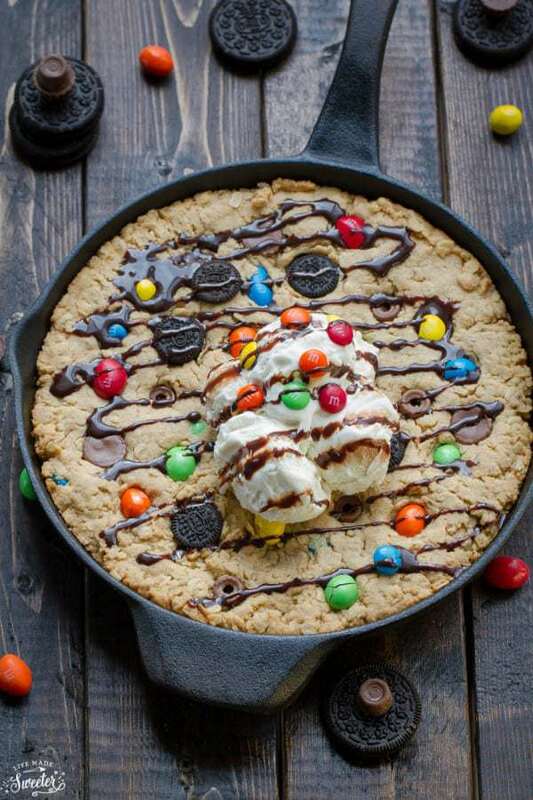 From Life Made Sweeter:: Click HERE for the RECIPE Candy Oreo Monster Skillet Cookie Pizza – a fun dessert perfect for sharing. Best of all, it’s easy to customize with your favorite candy on a soft and chewy peanut butter oatmeal cookie base. From Sweetest Menu:: Click HERE for the RECIPE If you like a cookie with a gooey centre but crunchy edges, then this is the cookie pie for you. The centre is soft and chewy and just about melts in your mouth, but the crust is golden and crispy. Bliss! 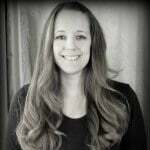 From: This Silly Girl’s Kitchen:: Click HERE for the RECIPE These are perfect for little mouths and much easier on portion control! 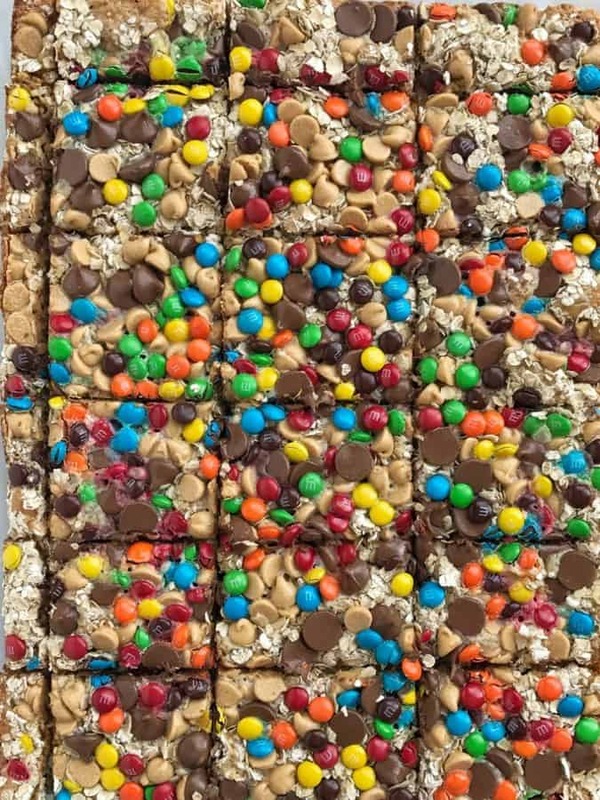 Peanut butter cookie base loaded with mini m&m’s and oats! They are so yummy, they will be your newest go-to! 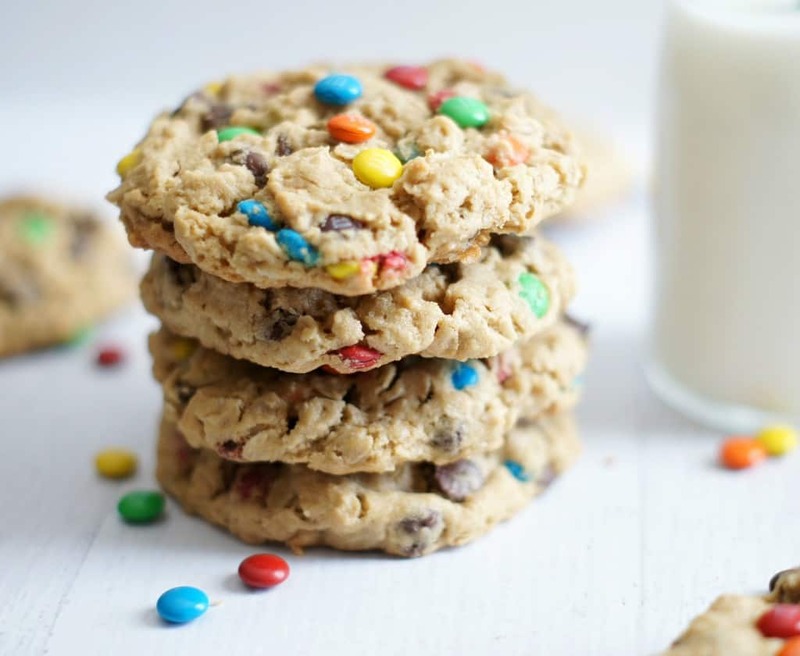 From: Just So Tasty:: Click HERE for the RECIPE These Soft and Chewy Monster Cookies are filled with peanut butter, chocolate chips, oatmeal AND M&Ms. Seriously… everything you could ever want in a cookie! 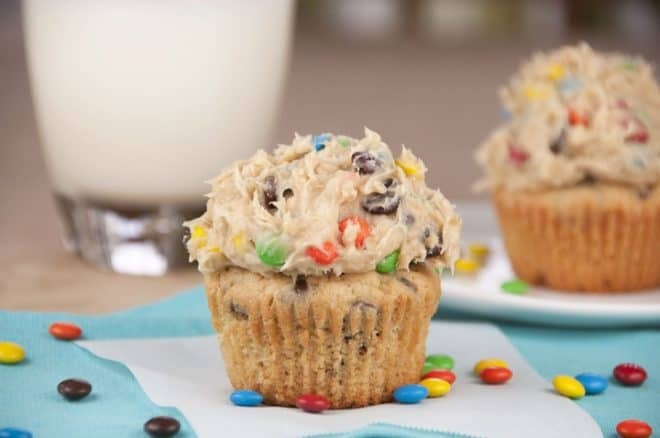 From Wishes and Dishes:: Click HERE for the RECIPE Monster Cookie Dough Cupcakes are rich peanut butter cupcakes topped with a sweet and loaded cookie dough frosting packed full with peanut butter, chocolate chips and M&M candy! This is the best cupcake recipe ever! 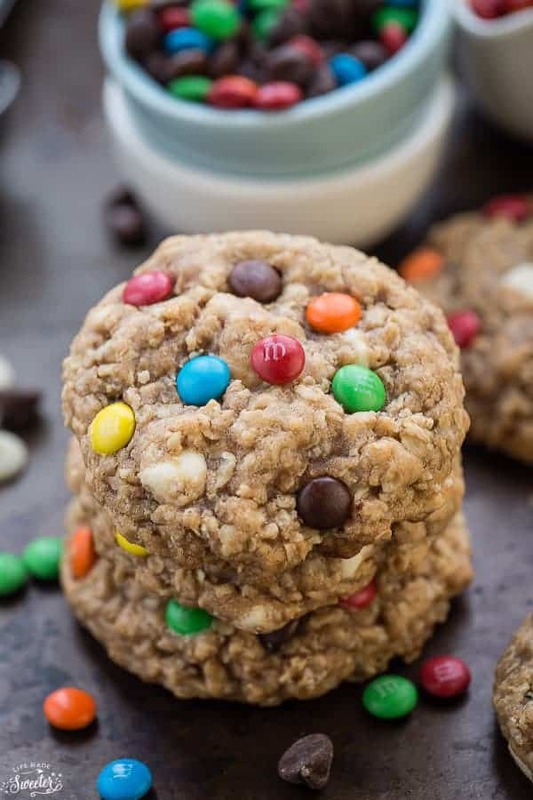 From Life Made Sweeter :: Click HERE for the RECIPE Oatmeal Monster Cookies with M&M’s are perfectly soft & chewy and so easy to make. The best way to serve them is with a tall glass of milk. From Inside Bru Crew Life :: Click HERE for the RECIPE Brownies topped with three layers of goodness. 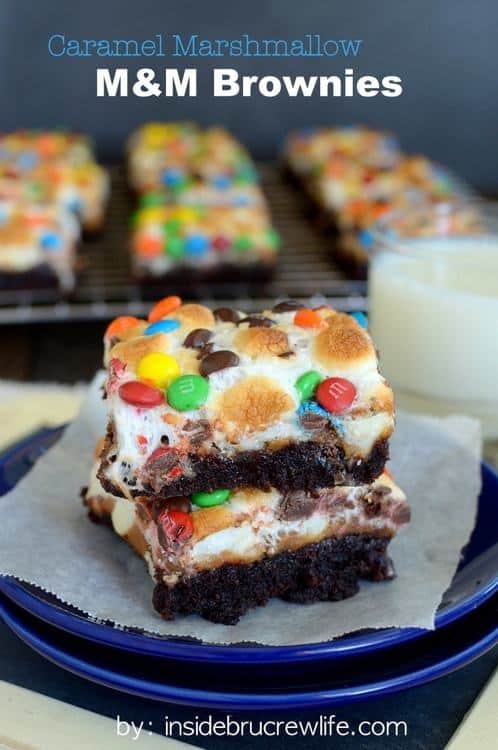 These Caramel Marshmallow M&M Brownies will definitely satisfy every sugar craving you have. They are a great way to use up leftover candy too! 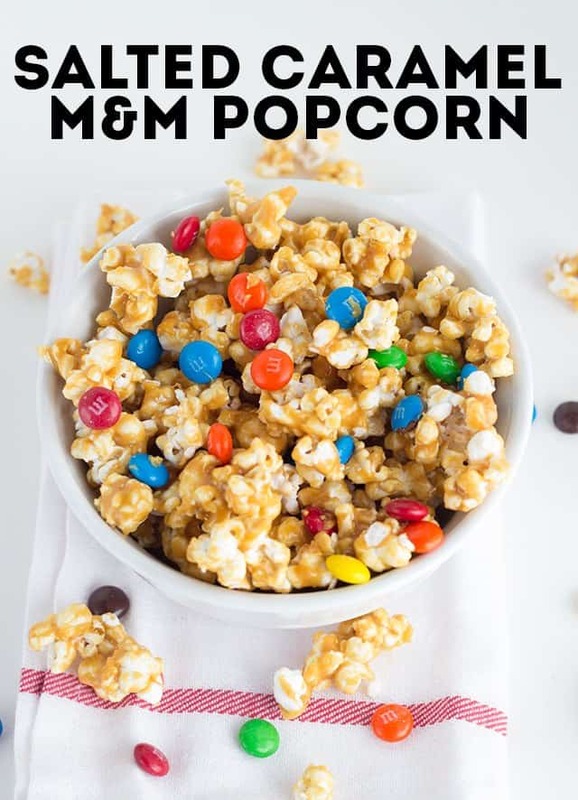 From Cookie Dough and Oven Mitt :: Click HERE for the RECIPE Salted Caramel M&M Popcorn. It’s sweet, salty, crunchy, and filled with M&M’s. This is the perfect addition to any movie night. 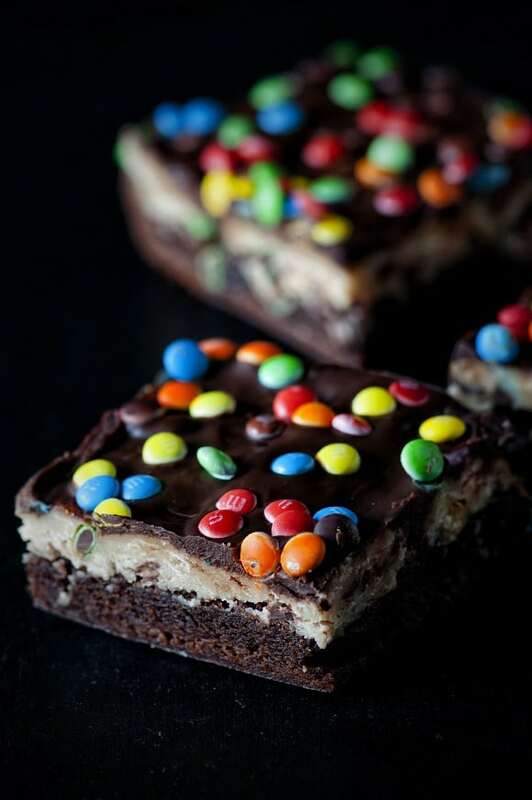 From Inside Bru Crew Life :: Click HERE for the RECIPE These chocolate M&M’s Brownies are full of candy goodness. They are a great fudgy snack for any time of day. They also make great lunch box treats or after school snacks. Add a glass of milk and you are good to go. What kind of oats do you use? Looks amazing! I think quick cook would work best!